I didn’t hear the thud – but then it was too big for the letterbox as well as being a weighty tome. I was delighted to receive my contributor’s copy of the Zondervan Dictionary of Christian Spirituality (edited by Glen Scorgie, Zondervan 2011) which arrived this week. With over 850 double-column pages it claims to be comprehensive and is certainly extensive. As you would expect with this publisher, the perspective is evangelical. However, the scope is catholic and presents information about a broad range of topics relating to spirituality and offers suggestions for further reading which are not limited to one part of world Christianity. Contributors who may be known outside North America include Eugene Peterson, Dallas Willard and Jim Packer, as well as the Baptists Clark Pinnock, Glen Hinson and Glen Stassen and the Pentecostal Simon Chan. The first two hundred pages or so contain over thirty essays offering brief introductions to various themes and topics. These include approaches to the study of spirituality, biblical foundations, historical and confessional traditions such as ‘Byzantium and the East’, together with topics such as mysticism, music and the arts, transformation, grace, ministry and spiritual formation. The dictionary entries cover the remaining six hundred pages. I also have on my shelf a (contributor’s) copy of the New SCM Dictionary of Christian Spirituality (2005), edited by Philip Sheldrake – whose contribution to the study of Christian spirituality I have greatly appreciated and from which I have richly benefited. The SCM book, like its predecessor edited by Gordon Wakefield, is a fine resource which offers authoritative introductions to a range of topics. However, I have, at times been frustrated by its silence with regard to some evangelical themes which are a part of the story and experience of Christian spirituality. The new Zondervan dictionary offers guidance from a different perspective, both in its theological ethos and, more particularly, in the scope of subjects covered. Used together, these two books offer a rich and comprehensive dictionary treatment of Christian spirituality. For example, in the Zondervan dictionary entries on Horatius Bonar and E M Bounds appear alongside entries for Bernadette of Lourdes, Bernard of Clairvaux, Anthony Bloom and Bonaventure. Zondervan entries which are not included in the SCM book include Conviction, Keswick, Revival, W J Seymour, Oswald Chambers and Glossolalia. The Zondervan selection also includes certain theologians who have influenced contemporary spirituality theology including Barth, Bonhoeffer, Gutiérrez, Rahner, Pannenberg, and Sobrino. Interestingly, there are also dedicated Zondervan entries (which are not to be found in the SCM book) on Gregory of Nyssa, John of Damascus and Søren Kierkegaard. These entries suggest, with many others, a focus on prominent people which could well lead dictionary browsers to discover their respective writings for themselves – a good and accessible move! Of course, many topics appear in both dictionaries such as, Hesychasm, Monasticism, and Prayer of the Heart. Even when the Zondervan contributor is cautious or critical, the tone is never other than generous, as in the article on Yoga. There is provocative and fruitful reflection on such topics as Postmodernity, the Name of Jesus, Masculine Spirituality and Prayers for the Dead. 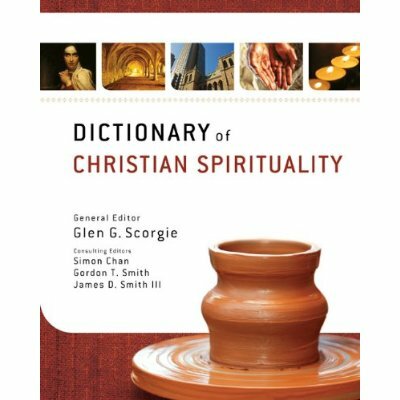 A further distinctive of the Zondervan dictionary is its attempt to encourage its contributors to include reflections on how the topic in question has practical implications for living a spiritual life today. It’s academic rigour is clear but its pastoral application is also in evidence and this will make it attractive to church ministers and other Christians who want to delve further into aspects of Christian spirituality. The reasonable price should also help it reach beyond academic circles and thus enrich the wider church and encourage Christian disciples in the life of faith. Well done Glen Scorgie and the team!